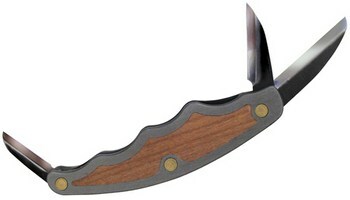 Flexcut Pro Tri-Jack Knife JKN95 Style JKN95. The Tri-Jack Pro has three blades that lock in place - a roughing knife a detail knife and a mini-cutting knife. The roughing knife is great for modeling surfaces and creating texture while the detail and cutting knives let you easily make the finest cuts. The Pistol Grip design minimizes hand fatigue and is made of aerospace-grade aluminum with a quarter-cut cherry inlay.